As I write this, I am sitting in my new kitchen, expressing milk with one hand, typing with the other, with a hundred and one jobs to do in our new house. But really all I want to do is sit and gaze at the gorgeous baby girl who is snoozing and cooing next to me in her moses basket. 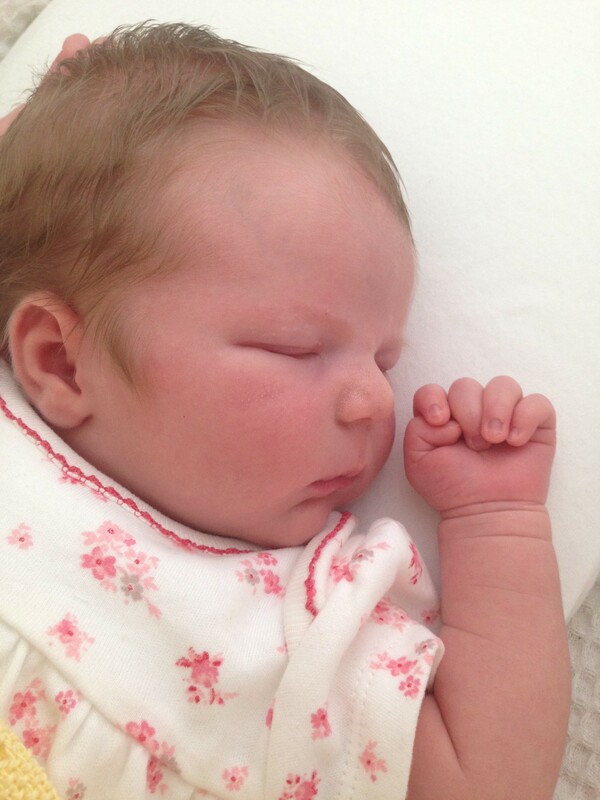 Three weeks ago today I was recovering in hospital after a bit of a traumatic birth. It feels like a world away already. At the time, the fact that I hadn’t managed to give Lottie the entrance to the world that I wanted to was breaking my heart. I had failed in my first task as her mummy. I felt useless, pathetic and I could not stop crying for the birth I had wanted but couldn’t have. I felt it was my fault that surgeons had had to intervene, that I couldn’t take her straight home. But now, three weeks into this amazing, exhausting, delightful and grueling journey that is motherhood, the memories are already fading, as most do with time, and my mind and body are healing, and all that really matters to me is that my beautiful little girl is healthy, happy (except when hungry or suffering from colic) and that I have everything I have ever wished for with my perfect little family in our lovely new house. But having chatted to my mum and some friends who have had similar experiences, I realised it is important to talk, or write, about all of our experiences in life as they make us who we are. I also think its important to highlight births that perhaps aren’t ‘normal’ so that new mums don’t have unrealistic expectations.As I probably did. On the morning of August 15th, I woke at 3am knowing I would go into labour that day. I only had slight period pains and had probably had stronger Braxton Hicks over recent weeks, but everyone was right – when it happens you just ‘know’. I got up and got a drink etc then tried to settle back down as they had advised in our parenting classes, and not disturb Mr M, who had been working on the new house until 11pm the previous night. Easier said than done when you’re on the brink of one of the biggest days of your life. By 5.30am, I couldn’t take it any more and woke Mr M to tell him. I’ll never forget his face – a pure mixture of shock, excitement and fear. We dosed and chatted about our new baby until 6.30 when Mr M got up to finish the flooring and get the living room ready to bring our new bundle home to. Having moved in just four days before, he wanted to get at least one room ready. I tried to occupy myself by having a bath and painting my nails. Sky arrived at midday as we had forgotten to cancel the TV installation, which was comical – they were a bit shocked when I told them I was in labour! Around 1.30pm, my contractions were regular enough to go into hospital. Having worried/terrified a few passers by with contractions in the car park, we arrived onto the lovely midwife led unit and were shown to a big en-suite private room with birthing pool by a gorgeous midwife called Alex. Alex monitored me for a while and said that she thought I was on the cusp of stage one labour, She didn’t want to send me home, thank goodness, but she didn’t want to examine me, as that would ‘officially’ start labour and she would have to examine me regularly from then on. So I had a bath to try and ease the pain and the contractions became stronger and more regular. Mr M said he could predict when the next one would start! I politely asked him not to though. Once I got out of the bath, the contractions got worse, so Alex started to fill the birthing pool for me, which takes an AGE to fill up by the way. I wallowed in there for a while and the water definitely helped with the pain. At about 6pm, the contractions were increasing and I started on the gas and air. Mr M and Alex were by my side for every contraction, encouraging me and soothing me. A urine sample had shown that I was a bit dehydrated earlier in the afternoon, so Mr M was bringing me water and saying all the right things. About 8pm was the point where my birth experience started to come a bit unstuck. The lovely Alex was going off shift and she introduced to the new midwife. I like to be as positive as I can about everyone I meet, but I immediately felt a distance with the new midwife, MW2 let’s call her. She didn’t introduce herself, she didn’t really speak to me and she went and sat at the desk and didn’t really interact. When she went out to take a urine sample to test, I said to Mr M that I didn’t think she liked me. At this point I was getting pretty tired and emotional and he passed it off as me being a little over sensitive at that point. I can’t fault MW2 in her practice. She was regularly checking the baby’s heartbeat and doing everything she needed to, but whereas Alex would tell us that all was fine each time she listened on the doppler, MW2 would just walk away to record her findings. I was offered an examination a few times, but it wasn’t necessary. I was scared to find out that I was only 1cm dilated or something after all that time, so I put it off as long as possible. Meanwhile, I remained in the pool. It was found that my sugar levels were on the floor, so MW2 was encouraging Mr M to get me to eat, but I had so little time in between contractions and was in so much pain that I didn’t really feel able to. I felt that MW2 thought I was being a bit of a wimp as I kept telling her that the pain was unbearable. At no point was I offered any other pain relief than the gas and air and the birthing pool. At around 9pm, I got out of the pool to be examined and was nearly fully dilated, with just a bit of my cervix still present on one side. MW2 told us that she thought my waters would break very soon and that we would then have a baby very quickly. How wrong she was. I realised at about 10pm, that my original due date going on my dates, prior to our 12-week scan, was in fact the 16th August. I joked with Mr M that maybe the baby was holding on so that it would arrive on that date. Little did I know that it would be well into the next day before our baby arrived. At around midnight, the midwife broke my waters and on examination about half an hour later, I was finally fully dilated and could start pushing. I didn’t really feel an urge to push, but she urged me to do so in a kind of ‘just get on with it’ fashion. I pushed in every position imaginable for four long hours. I pushed on the toilet. I pushed standing up, squatting, leaning over the bed. I even pushed on a birthing stool. Which was agony on my back. I have never in my life felt so tired or so useless. MW2 kept saying things like ‘come on now, try a really big push this time. Bigger than before,’ which was leaving me feeling pretty deflated. I pushed with all my might and despite any aspersions that midwife may or maynot have had, I am a pretty tough person. I don’t shy away from hard work and I would have done anything in my power to deliver my baby myself. Anything. By 3am, I was back on the bed for another examination and between contractions, I literally could not stay awake. My eyes were rolling back in my head and Mr M said he thought I would start fitting. At about 3.30am, the cut-off point of four hours fully dilated arrived and I had to go down to the consultant led unit, I was put in a wheelchair, Mr M was barked at to bring all our belonging with him and given no time to do so. I really felt for him, as he was getting worried and was probably shattered himself. I must say at this point that I could not have wished for more in a man than my husband gave me that day. He was with me all the way and his support and love were unfaltering. As we arrived in the CLU and I was hooked up to the fetal monitors, all hell broke loose. The baby’s heartbeat was dangerously low, panic buttons were hit and the room was suddenly filled with medical professionals. I was terrified and I could see Mr M was too, although he was trying his best to appear calm. The most lovely surgeon appeared at my side. A giant of a man who instilled the greatest of confidence. He asked to examine me, immediately told the team what he thought and quickly confirmed the diagnosis with a scan. A top consultant had just told me I couldn’t. Why was she saying this? Was she trying to prove a point? Very soon I was being taken into surgery with a team of some of the kindest, most gentle and professional people I have ever had the pleasure to meet. The spinal kicking in was perhaps the greatest relief I have ever felt in my life. 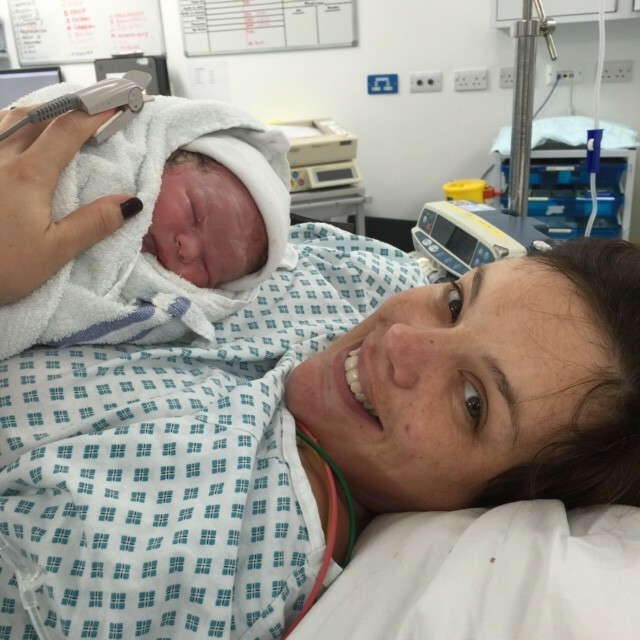 I then had an episiotomy (but still managed to get third degree tears too – ouch) and the lovely surgeon bought our baby into the world with forceps. Mr M told me with tears in his eyes that we had a little girl and he cut the cord. Sadly, we didn’t get the delayed cord clamping, or the immediate skin to skin I had so desperately wanted, but she was here, she was safe and she was beautiful. After I’d had a cuddle, Mr M took our baby through to recovery while I was stitched up. I had lost a huge amount of blood, so was hooked up to drips galore to get me back on my feet. More on that in the post-birth post. MW2 wheeled me back to recovery when I was done and we were met by a fabulous midwife on that ward called Daniel. He greeted me, and MW2 and asked how she was. ‘After the night I’ve had, you don’t want to know how I am,’ she replied. I may have still been numb from the chest down, but my feelings were still in tact. I’m sorry to have been such a burden. After roughly trying to get Lottie to latch, without having even asked if I wanted to breastfeed, MW2’s shift was over, she left after a very brief goodbye and the relief was huge. Every single person I came into contact with otherwise was fabulous. I could not have asked for better care and I will be forever grateful for the staff’s support and care. The original midwife, Alex, even came down to find me when she went back on shift the next morning after she had found I had left the MLU. But what happened with MW2? Perhaps she had had a bad day. An argument with her other half. I definitely think there was some kind of competitive nature to the manner in which she handled my labour. She wanted me to give birth on her watch and she did not want to have to ask for a consultant’s help. Do you know what though? Whatever her reasoning was, I don’t really care. I have the most sympathy for people having a bad time, but when you embark on a career, be it a midwife, a doctor, or even a marketing manager, as I am, you have to leave your personal life behind. Sometimes it’s hard, but when your actions, behaviour and treatment of others has an impact on one of the biggest days of their lives and your stubornness puts a baby’s life at risk, is it acceptable to allow your feelings and thoughts or your own bad day to influence you? I would say no and I am very sad to have been on the receiving end of whatever was wrong with Trudy that day. I just hope that her next patient catches her on a better day and doesn’t go through what I had to. I am left with many questions. Why was I left pushing for so long? Why was it not picked up that Lottie was face first or back to back sooner? What would have happened if we didn’t go down to CLU when we did? Could I have delivered her on my own after all? But my biggest answer is still snoozing beside me. This little one is perfect and we are so lucky to have her here, healthy and happy and the best thing we have ever done. Congratulations it sounds like you had a tough time but she is worth it I’m guessing. I can’t wait to start a family but the thought of birth gives me anxiety. Reading posts like yours where things didn’t go to plan but your still happy and positive gives me such relief. Oh I have only just been able to read your birth story. I am so sorry you had to go through what you did. I am speechless and appalled at this midwife’s behaviour. It must have been such a distressing day for you and your partner. I am so pleased to hear that all turned out well in the end despite the stitches and everything, you delivered a healthy beautiful little princess.